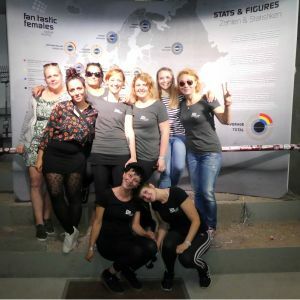 Last weekend the makers presented "Fan.tastic Females - Football Her.Story" at the FC Sankt Pauli Museum at Millerntor. They were overwhelmed by the great response from a total of 1000 visitors, the emotional reactions of the protagonists and the extremely positive feedback. The excitement and tension were obvious on the organisers' faces when the first European exhibition on female fan culture finally took place on Friday evening in front of 200 invited guests, after an endless number of working hours. Had they thought of everything? Would everything work out? Does the exhibition do justice to its protagonists and do the #FanTasticFemales also go down well with the general public? So it was hardly surprising that one or the other eye did not remain completely dry when co-initiator Daniela Wurbs, representing the entire FanTastic Females crew, solemnly thanked all participants and supporters before the doors opened for the first premiere guests. And after their first tour through the exhibition at the latest, they expressed their enthusiasm with shining eyes, the last tension fell and it was clear: They had not only made it, but also rocked! Nicole Winkelhake: "We would also like to thank the FC Sankt Pauli Museum, the fan club speakers’ council, Ultrà Sankt Pauli and the support block for their great help, from the construction to the workshops to the party. Thanks to the many helping hands, the opening was not only an unforgettable experience for all of us, but also a grand party." Greta Rinast: "The best thing about the weekend for me was that fans from different clubs and especially from different fan categories (Ultras, jersey fans, VIPs etc.) came together to exchange ideas and network. I'm really curious to see what thoughts and discussions the exhibition will trigger in the future and I'm sure that we'll meet and bring together many more Fan.Tastic Females." Antje Grabenhorst: "As an exhibition organizer, you haven't seen the wood for the trees at some point after years of very detailed work, so it was really nice to see how many people this exhibition makes happy. So many women and men have approached us again and again and were just enthusiastic and grateful. We have realised a giant thing and can definitely celebrate ourselves." Picture gallery of the premiere weekend in Hamburg at the Millerntor on Facebook.